Damon Albarn, pop musician (Blur, Gorillasz), born 1968, lived for 10 years in Fillebrook Road, Leytonstone 1 (photo right) until his family moved to Colchester. He went to George Tomlinson School. His mother Hazel was a stage designer for Joan Littlewood's theatre company 2 at the Theatre Royal Stratford (east London) and his father Keith worked on TV arts programmes. Cornelius Cardew, born 1936 in Gloucestershire, stretched the boundaries of musical composition and in the 1970s was at the leading edge of Marxist politics, was killed in Leytonstone in 1981 by an unidentified vehicle driver. 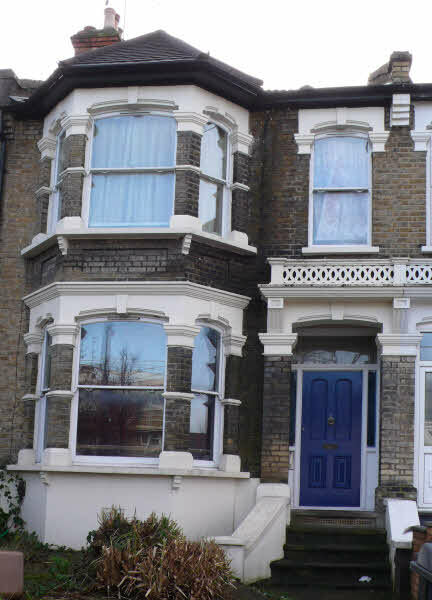 Cardew had been living at 28 Leyton Park Road 3 (photo on left). Actress and singer Rita (Joanne) Simons was born in 1977 at Whipps Cross Hospital. Talvin Matharoo Singh was born in 1970 at Leytonstone and helped create the Asian Underground music genre.